Home / sale / samsung appliances / smart tv / Enjoy up to 35% off at The Great Samsung TV Sale. Enjoy up to 35% off at The Great Samsung TV Sale. Assemble a state-of-the-art home cinema with Samsung’s cutting-edge TVs. With the Samsung's 20th anniversary in the country, now is the best time to upgrade and experience next-level family entertainment with the Great Samsung TV Sale. The anniversary models—the QLED 6 Series, the Premium UHD (PUHD) TV, and the Curved UHD TV—carry sizes from 49- to 82-inches. Make sure that there is a spacious wall or sturdy platform for the TV. With the Samsung TVs’ sophisticated design, less space is needed for the cables. The unit keeps all the wires intact and hidden at the back. This ensures boundless and uninterrupted viewing experiences. 2. Set the ambiance with movie posters, toys, or cozy pillows. Replicate the movie house atmosphere with film-inspired decorations, such as playbills and figurines of popular characters. Make sure that everyone’s cozy with huge bean bags or plush pillows. These further elevate the cinematic clarity and feel that the QLED TV delivers. It takes audiences to a world of a billion colors with the Color Volume 100% feature, and its Q High Dynamic Range (HDR) upgrades movies by making shadows and silhouettes sharper. The QLED TV can even blend with the interiors with Magic Screen. The immersive viewing experiences that the Curved TV variants deliver are best paired with surround sound. As one gets to the heart of exciting visual action, feel every beat and rhythm with Samsung Soundbars. The Curved TV reduces instances of eye strain, while the Soundbars make any room have top-notch acoustics. Combined, these devices provide a pleasing and engaging sensory experience. With the anniversary models, enjoy any program that the family might like for movie night. Samsung TVs offer Smart Hub, a feature that pools multiple channels in a central panel. The TVs also support the SmartThings App, which allows users to introduce unlimited content from their smartphones to the unit with ease. Meanwhile, the One Remote feature of QLED 6 Series and PUHD enables users to control the TVs and compatible devices for hassle-free moments. Create elevated and cinematic entertainment experiences at home with the Great Samsung TV Sale. Head to the nearest authorized dealer now to know more about these innovative devices. 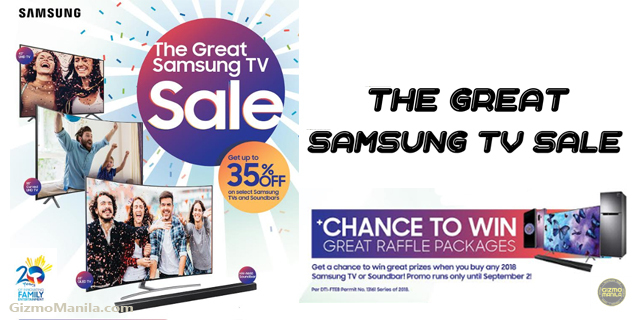 Also register in the Great Samsung TV Sale raffle and get a chance to take home exciting prizes, such as Soundbars, smartphones, refrigerators, and other TV units.